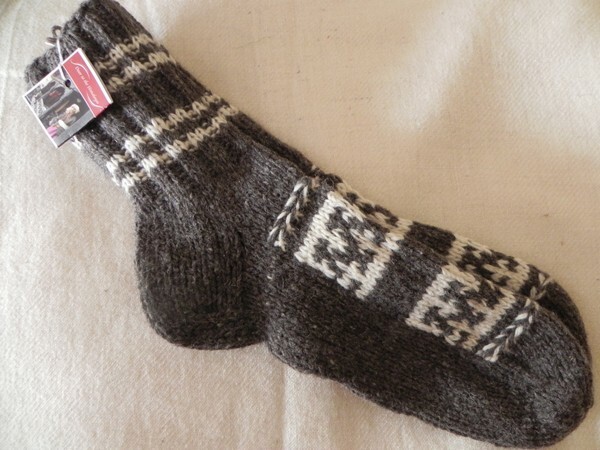 Handspun and hand knitted in 100% local sheeps wool mens socks. These socks are incredibly warm and make excellent boot socks for cold winters, tried and tested by shepherds from the Botiya tribe who live high in the Himalayas on the Indo-Tibetan border. They live in an isolated community, completely cut off for the winter by the harsh weather conditions and it is the tradition for their wives to knit using wool from their own sheep. Door to the Himalayas is working with the Botiya people to bring their lovely rustic hand knitted products to market and to build a sustainable trade route to a wider market.